Hey guys! I have finally put together a great list of Gifts for Your Shop! Many of you have been asking me about lots of things in my shot that get spotted on pics or videos so I thought I would put together a quick list of different items that I use in my shop that you can either snag for you or as a gift this season. 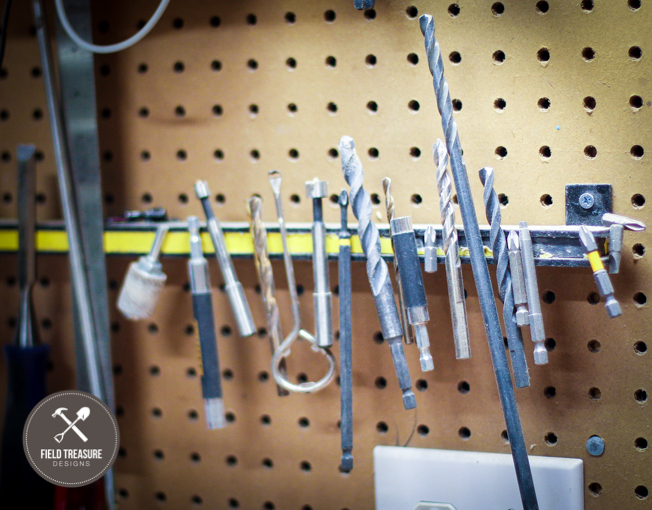 These are staple items in my shop that I use almost every time I’m in there. It is not exhaustive as I literally grabbed my camera and shot was already out so you know its genuine! By the way, don’t forget to follow me on Instagram, Facebook and Pinterest to keep up with everything I have been up to! 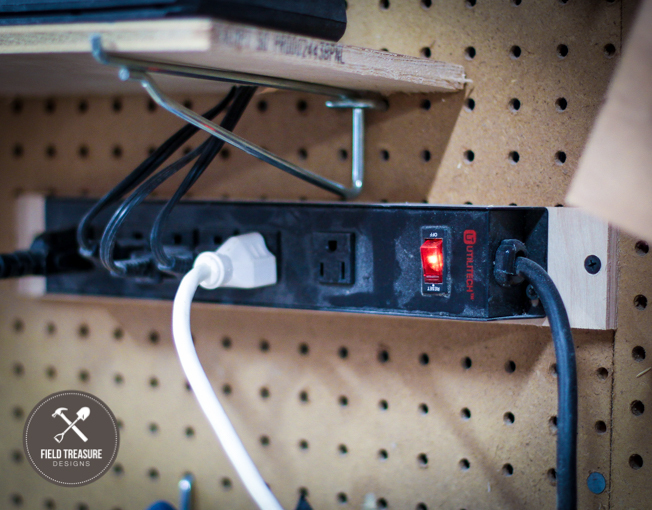 It might seem like “duh” but I love these power strips. I am able to isolate strong power tools so if I end up blowing a circuit, I can easily reset it versus going all the way to the house panel box. Also, when I close down the shop, I flip all the switches (I use the one with a light for easy identification) off so I know there is no power drain in the shop when I am not in there. Its also a good safety measure to make sure nothing can get turned on without me. Mine is sure dirty here in this picture, but if you like your coffee or tea to stay HOT, then get this! It is a simple mug warmer and I have one in my shop and one at my desk. I used to have the Bosch Power Box (Bosch PB360C Power Box Jobsite AM/FM Radio/Charger/Digital Media Stereo ) for my outdoor speaker which was an awesome speaker, but WAY too big for the shop and I didn’t need all the charging ports. This Anker one is also bluetooth enabled so I can connect it to my phone with no cord. It doesn’t take up much room and I can take it anywhere which is awesome. Having a magnetic bar right above my main work area has been the best thing I didn’t know I needed. I found it in Home Depot one day and put it up and now you can see what happened. It is fantastic for all those misc. 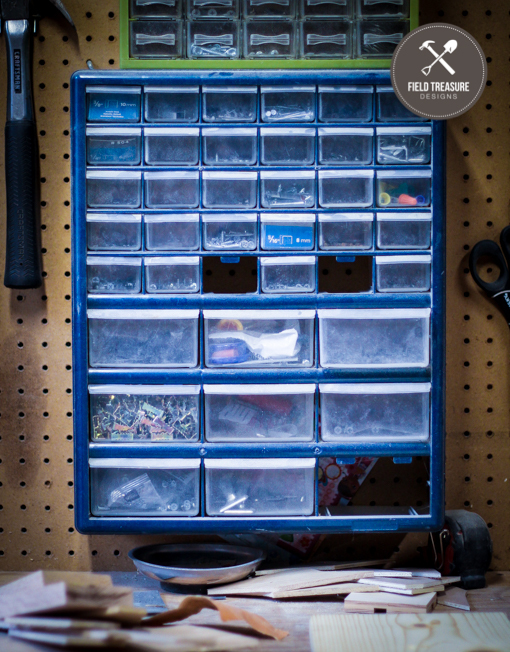 tools you need off and on and to keep your work counter cleared. 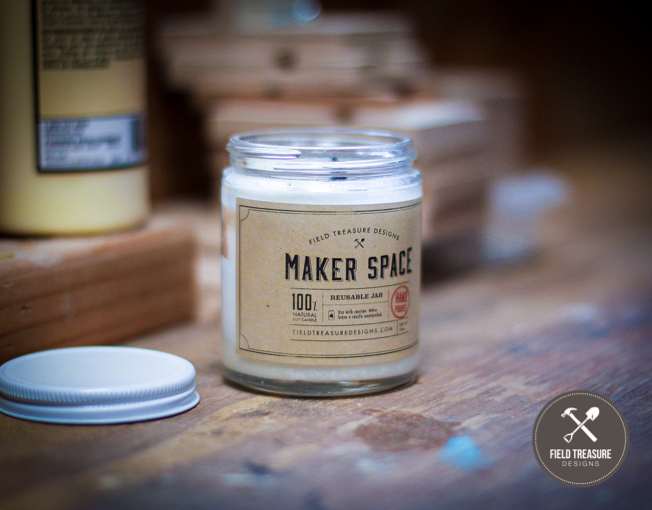 What workshop isn’t complete without one of our Maker Space candles?! I love lighting one up when I am working. 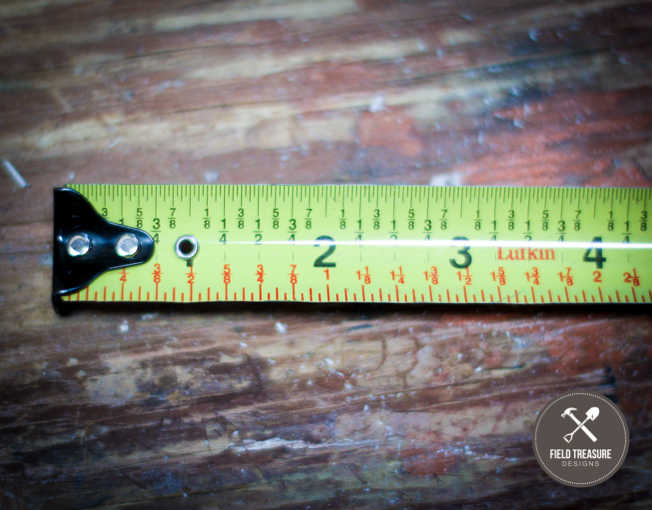 Of all the tape measures out there, this one is my most used and go to tape. The reason being is it is bright and has good smooth retraction. But the main reason I use it is because it helps you quickly identify the midpoint of any measurement. I use this WAY more than I every thought. Safety!! Dude, did you ever know how cold ear protectors are when you first put them on in the winter when you shop is freezing?! If anyone has a solution, please let me know! Haha. 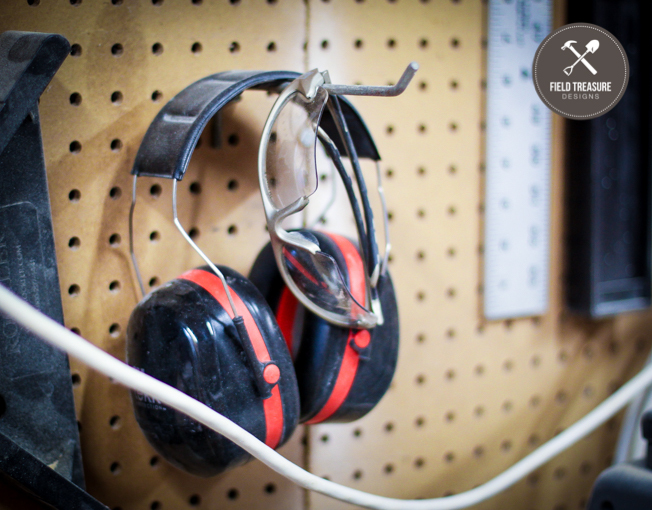 Anyway, these are basic glasses and ear protection that are a must to keep you safe. I LOVE the muffs shown hear as they cover my entire ears (not easy, lol) and protect me from noise but also letting me hear certain frequencies like music or someone talking to me. The glasses in my picture are different than the link below. I actually like the DeWalt ones I am recommending on Amazon better than the ones I am showing you here. 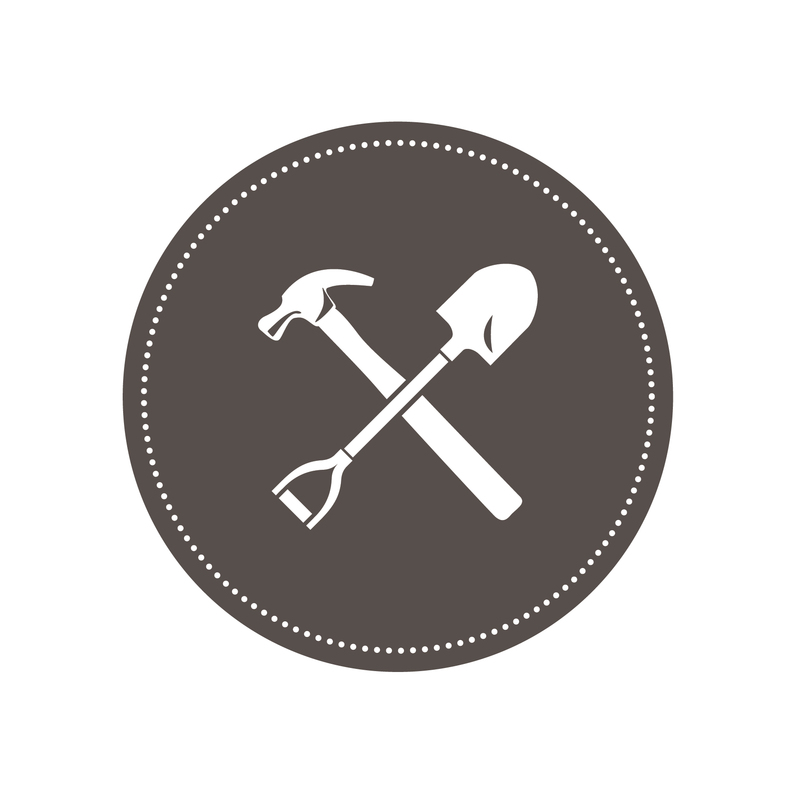 This was another tool that I didn’t know I would use so much. 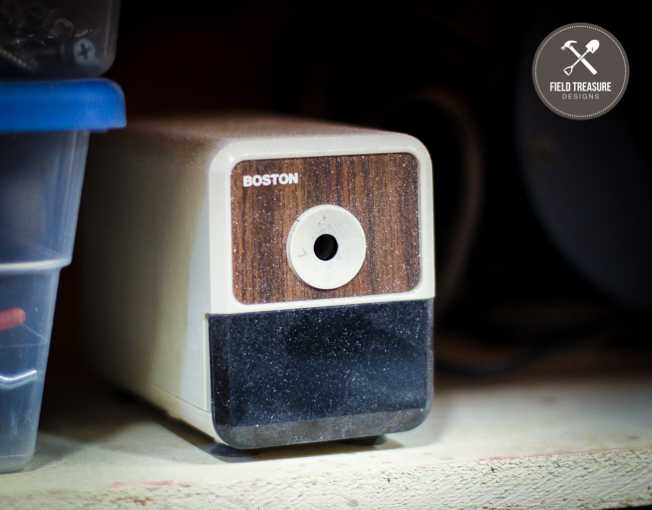 I bought this Boston Pencil Sharpener on eBay and LOVE it. 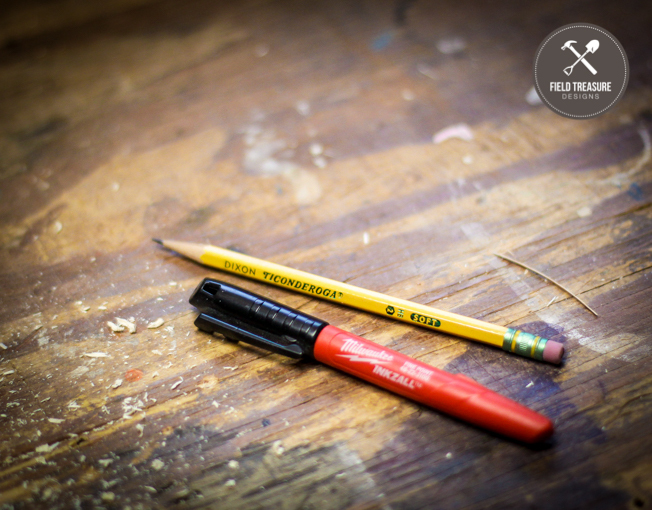 My kids also love sharpening pencils as well. 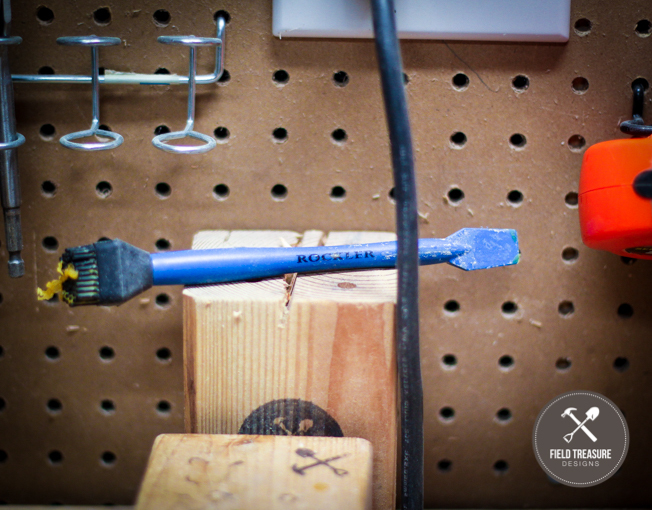 The best and safest tool for the table saw or router station is the MICRO JIG! I RARELY use my table saw without it. 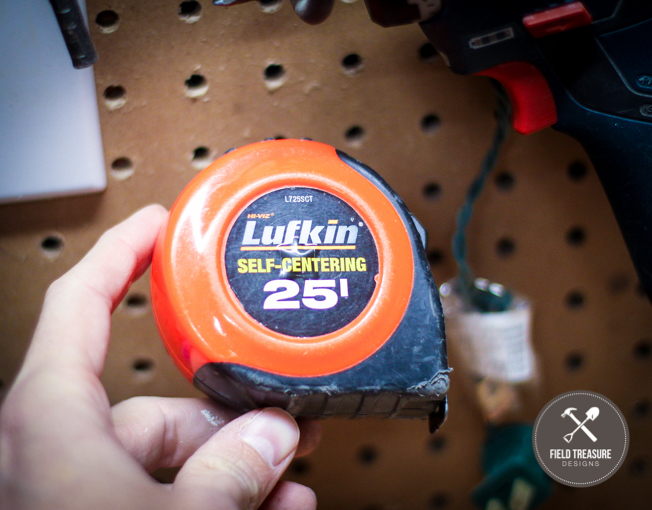 If you are a wood worker, this is a MUST! 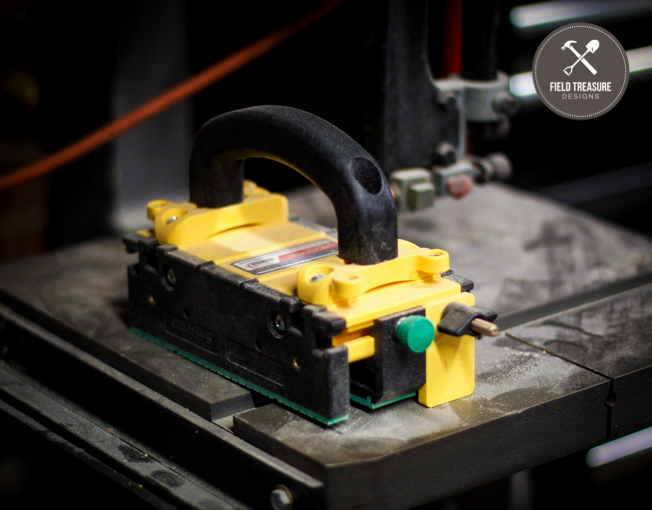 You are able to safely control your workpiece better than ANYTHING out there today. Spreading out glue has never been easier (or more fun) and my friend Jaime from ( http://thatsmyletter.blogspot.com ) and I agree that once it is dry it is a favorite past time to pick out the glue. Get one now! Mark stuff up! For pencil marking, I use the Dixon #2 and for darker stuff I go with the Milwaukee sharpie. They are both super reliable. 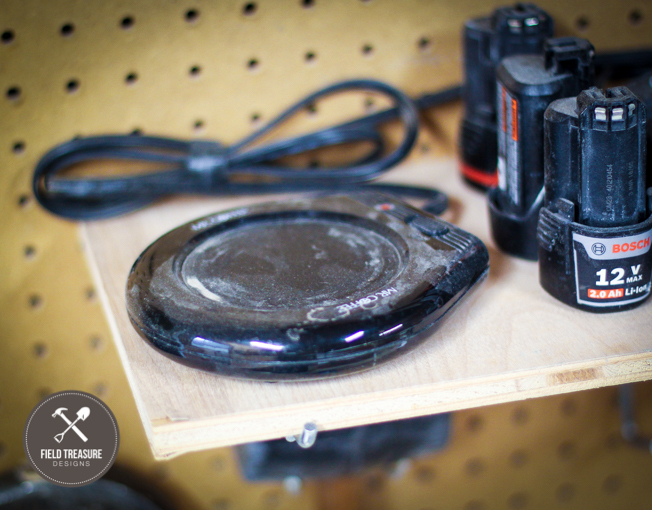 I always want to keep my iPhone charged up in the shop, especially if I am doing photos, videos or playing music. 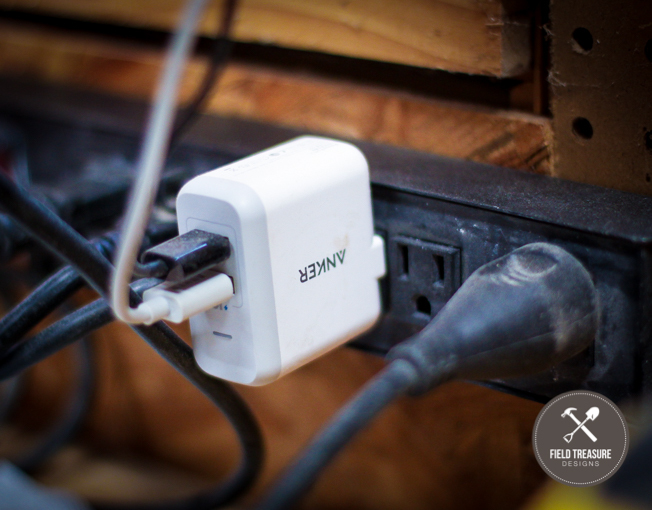 Having a dual port USB block charger keeps the clutter down and lets me power other stuff as well. Like my Anker speaker. The Glu-Bot. Just get one. Seriously. Now. Stop waiting. Or ask for it for Christmas. 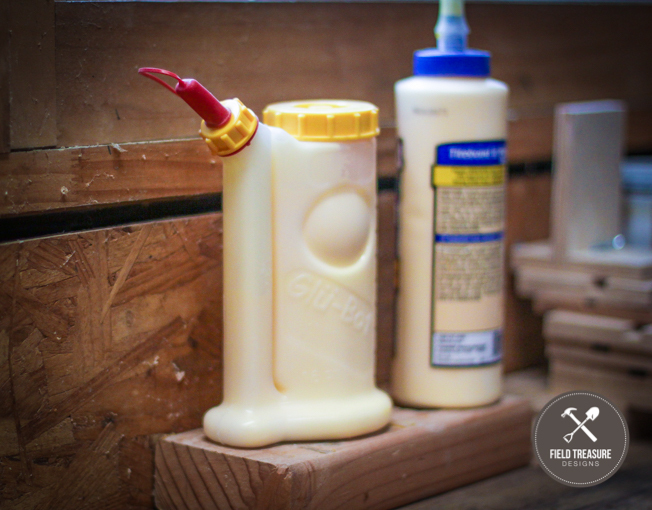 It is the best glue applicator out there. Especially for vertical stuff or small applications. Ok, this is another possible “duh” item but getting a set of cheap assorted drivers with a wall mount is super handy. These are all ones that I don’t mind beating up. So when it comes to prying, driving, scraping, drilling, pounding, and all the other random stuff you do in your shop, this is a great and accessible set. I love having them easy to grab. Also, the star drivers are excelling nail removing punches. Last but not least! This has been the most recent addition to my shop. And believe it or not I saw it at the store at a great price and realized how HANDY this would be. 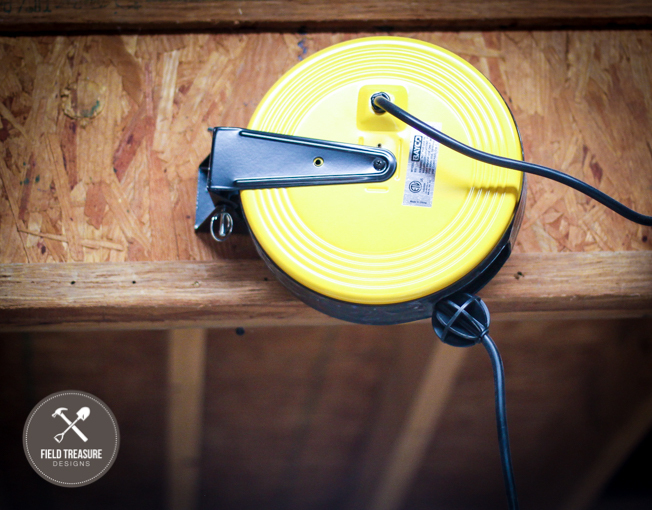 It is a wall or ceiling mount power cord extension. 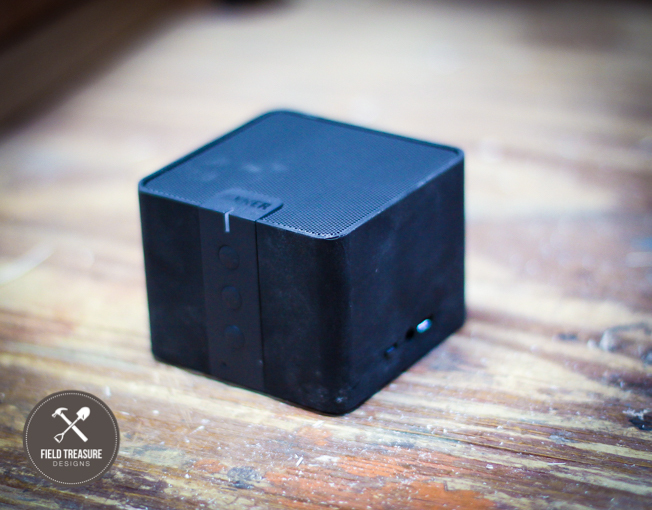 You can plug up to 3 grounded plugs into it and it swivels around. The one I bought is 30 feet which is plenty for my small shop. It is so nice being able to plug random tools in that I don’t use all the time (palm router, circular saw, band saw, jointer, ect.) without having the cord on the floor. I hope you enjoyed this post and will find some great Gifts for Your Shop! 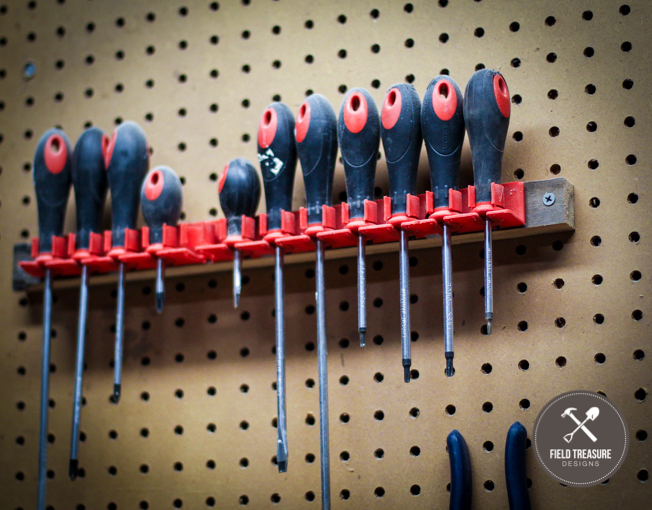 Let me know if you have a must have tool in your shop! I’d love to hear about them. So glad! Hope he enjoys and Merry Christmas!